Between the late 1990s and 2012, around 10 small satellites were launched annually; the next six-year forecast is for over 3 000. The European space sector has a chance to gain a prime global position, helped by the right energy storage system. The small-satellite (nanosatellites) sector is growing, driven by increased miniaturisation, standardisation and reducing costs. However, crucial for its success—in offering high performance for a wide range of applications—is efficient and reliable energy storage. The EU-funded MONBASA project set out to develop an energy storage solution; compliant with existing standards and regulations, reliable, with high energy efficiency, while remaining light and compact. The researchers designed new thin film components, crucial for the next generation of high voltage all-solid state Li-ion rechargeable batteries. Ensuring standards of safety, robustness, energy density, vacuum compatibility, radiation resistance and operating temperature window, makes the batteries ideal for space applications, as well as others such as the Internet of Things (IoT). While nanosatellites have become very popular, with the number of developers and projects ever-increasing, MONBASA's starting point was that innovative energy storage solutions could boost the sector even further. The team first developed a solid state battery based on a high voltage electrode couple and ceramic solid electrolytes, with ionic conductivities much higher than commercial solid electrolytes. As the integration of the solid electrolyte has to be achieved for the consecution of a functional full cell, getting the contact right between cathode and electrolyte, was critical. To fully analyse the physical and chemical properties of the battery interfaces, the most advanced analysis tools were employed. The next step was to study battery integration with state of the art satellite sensors such as microelectromechanical systems (MEMS), a crucial technology for sensors and actuators in advanced satellites. The solution was tested and validated under space-like conditions. "We adopted processing methods from the microelectronics and technological glass industry, that are compatible with nanosatellite fabrication. These were crucial for obtaining high quality thin film Li-ion battery components that out performed current commercial components," project coordinator Dr. Miguel Ángel Muñoz explains. MONBASA has demonstrated that thin film electrodes tested against commercial liquid electrolytes can have a lifetime one order of magnitude higher than conventional commercial electrodes. In practice this means that the current Li-ion cells could be increased by only changing the electrodes. Theoretically the liquid electrolyte should not be stable at the high voltages delivered by the MONBASA cathode. However, the thin film cell kept more than 80 % of its initial capacity for more than 2 000 cycles, at high current rates and after integrating the solid electrolyte, stable at high voltages, the cell performance will be even higher. The project also found that the MONBASA processing method for the negative electrode, tested against a commercial reference solid electrolyte at only 45 °C, matched the performance of conventional cells operating at 70 °C. As Dr. Muñoz summarises, "The MONBASA all-solid-state batteries have the potential to overcome the challenges the space sector currently faces with commercially available Li-ion batteries." He elaborates: "Longer living battery components will result in less failures and so longer satellite lifetimes. Smaller sized thin film high voltage batteries will allow smaller satellites, reducing collision risks. And a wider temperature window, will improve safety and performance under extreme conditions." 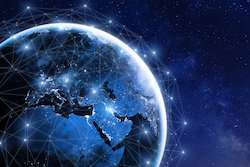 In its Space Strategy for Europe, the European Commission emphasised the importance of innovative space data and technologies, for services indispensable in the daily lives of European citizens. Small satellites are especially useful for novel applications as they are relatively inexpensive to build and launch, affording opportunities within a range of target markets, such as telecommunications, agriculture, transport and the environment. These services help protect and manage critical infrastructure, strengthen economic competitiveness, manage the resources for a growing population and tackle climate change pressures. "Beyond space satellites, the project results are of interest for other applications such as powering autonomous sensors for IoT and wearable devices such as for health monitoring." But Dr. Muñoz points out, "Future efforts will have to be focused on optimising interfaces that enable the integration of a thin film cathode with a thin film electrolyte. In parallel, upscaling components fabrication should be prioritised."